Some things are just fun to say, or at least try to say… like Conshohoken, Cuyahoga, Passyunk, or Copenhagen…I quite enjoyed saying Enchilada Frittata! Preheat the oven to 350F. Using a spiralizer, spiralize the zucchini onto paper towels. Change the paper towels a few times to help rid the zucchini of excess water. Whisk together yogurt, cheddar, eggs, seasoned salt, red pepper flakes, chili powder, and granulated garlic, and 2/3 cup green enchilada sauce. Chop the bell pepper (green, if your want to stick with the theme), onion, and broccoli. After a few rounds and changing paper towels, use kitchen shears to roughly cut through the spiralized veg, then toss in with your other bowl of vegetables. 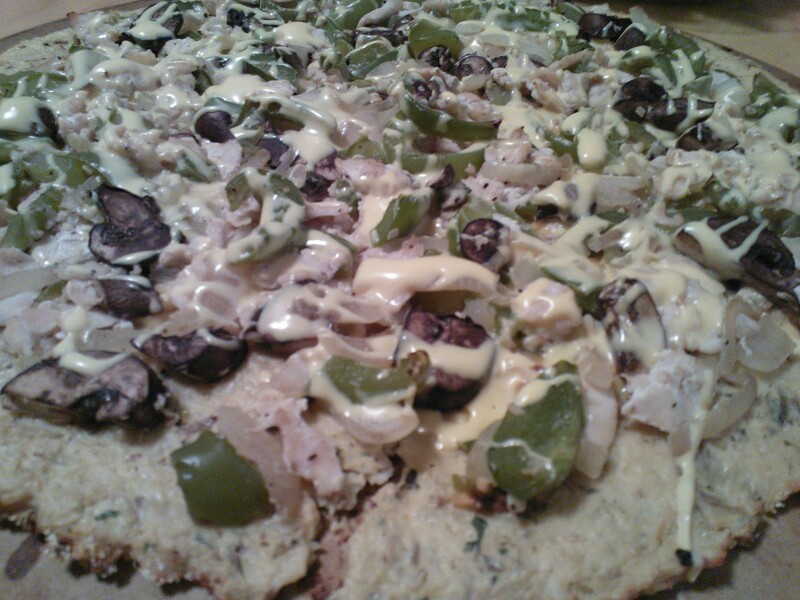 Evenly distribute the vegetables into a 9-inch pie pan, sprayed well with non-stick cooking spray. Pour the egg mixture over top and bake, uncovered, for approximately 25 minutes. Remove from the oven, and spread the remaining enchilada sauce over the top, followed by the chili powder, for topping. Return to the oven until fully cooked through, approximately another 10 minutes. Wait about 5 minutes for the frittata to set before slicing. Ok… I’m done work early, and have 1 and 1/2 heads of cauliflower in the fridge…. Game on! Cut your cauliflower into pieces and place in you food processor. Process until the cauliflower is riced. Measure out 6 cups of the riced cauliflower and transfer to a bowl. Microwave for 8 min. 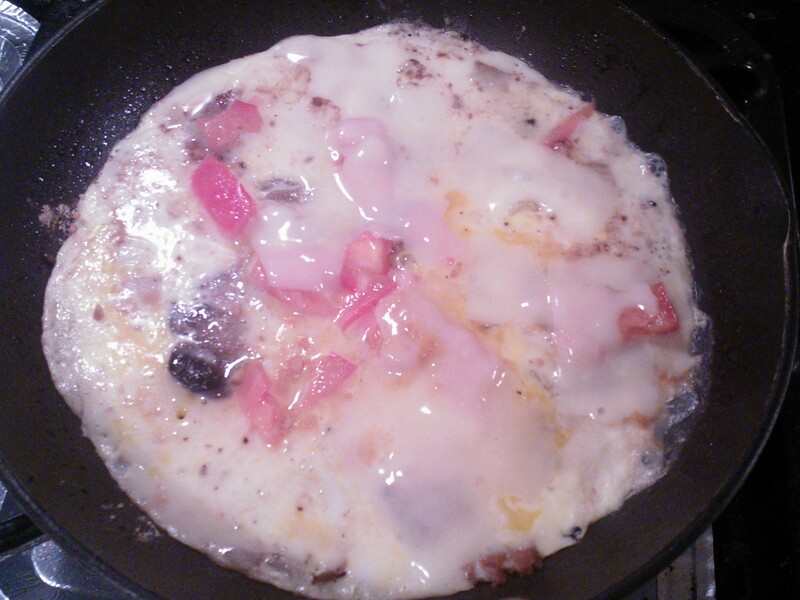 While awaiting the microwave, combine the liquid egg substitute, with shredded and grated cheese, along with seasoning. Toss it with a fork and set aside. 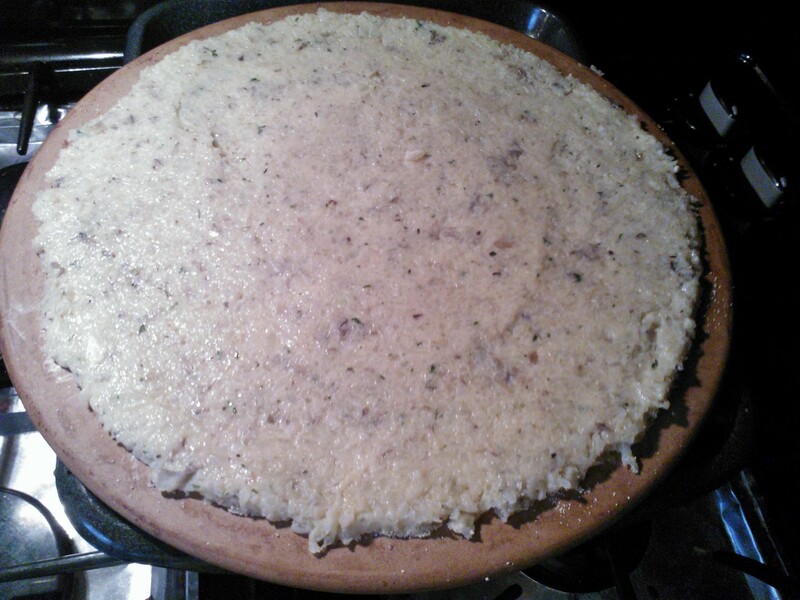 Carefully transfer the steamed cauliflower to the cheese cloth and remove as much liquid as you can. Don’t sweat it, if there is still some liquid in the riced cauliflower, just don’t burn yourself trying to get it all out! Transfer the strained, riced cauliflower to the bowl of egg, cheese, and seasoning. Use a fork to blend and flush ingredients together. 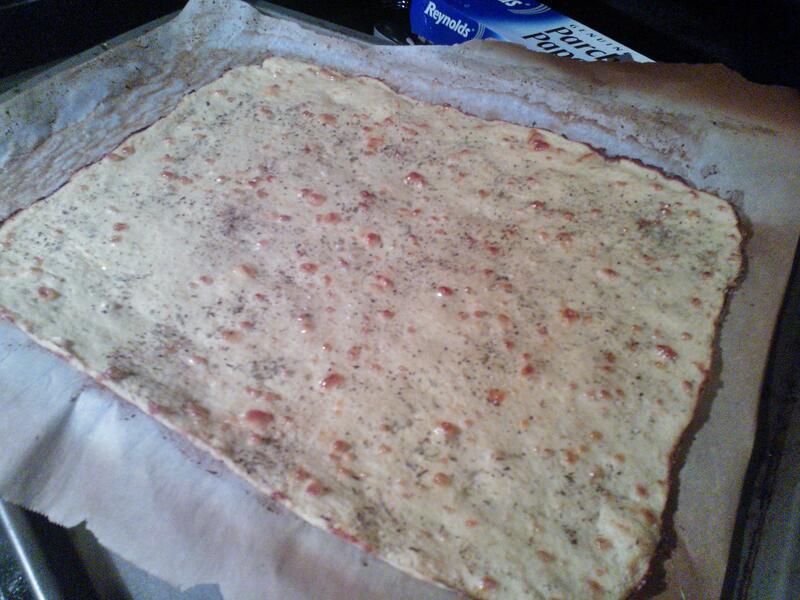 Spray a parchment paper-lined baking sheet with non stick spray, and dump you dough in the center. 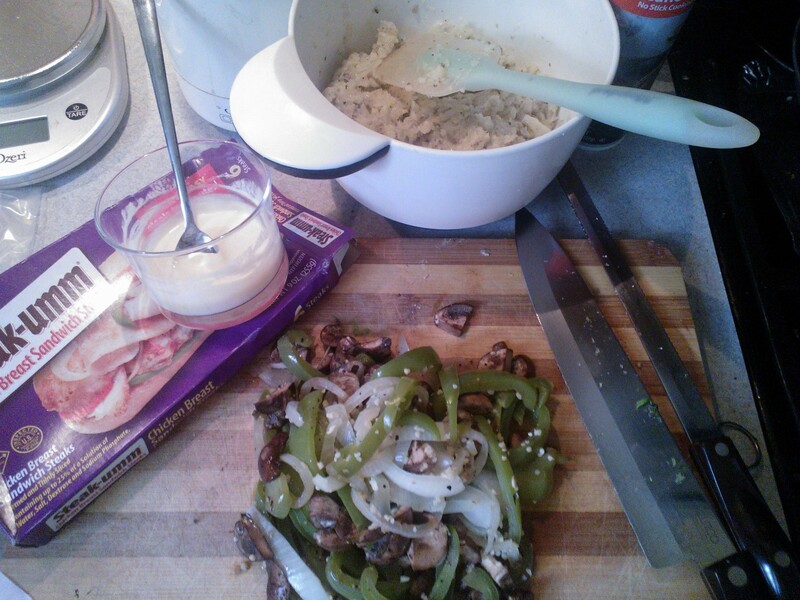 Using to hands, spread the dough to the sides and approximately 13-14 in long. Bake for 13 minutes. While this is baking, figure out what you want to add. 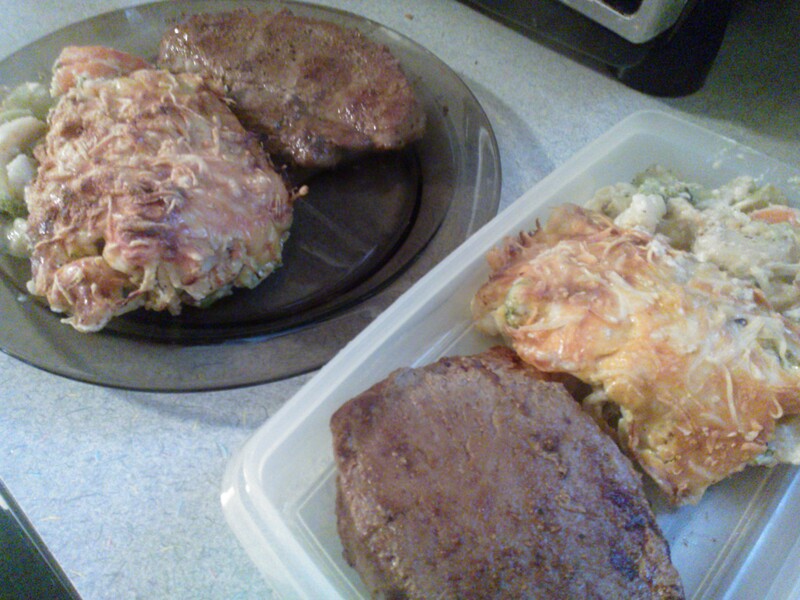 I highly recommend using this time to cook down and vegetables, and cook out some grease from meats. Its pretty simple. 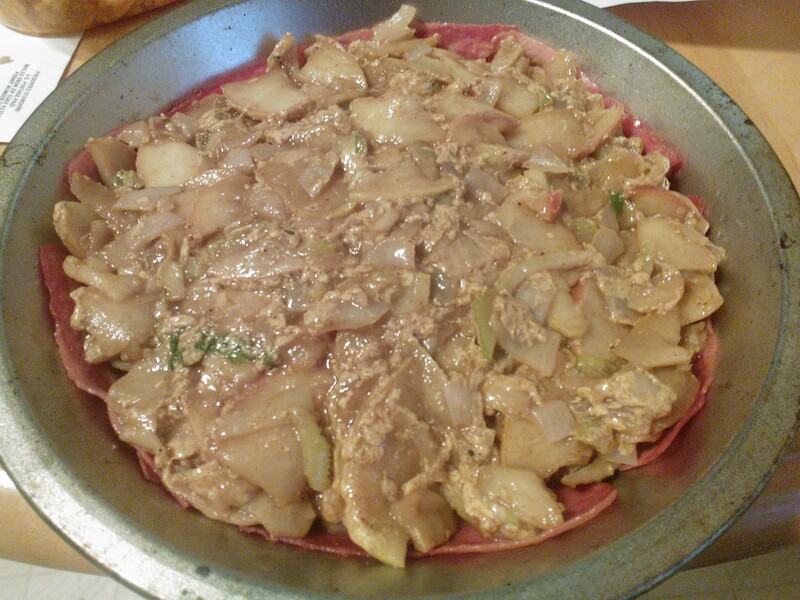 Throw all your goods in a pan, cover with a lid, and cook over medium. Once your timer sounds, remove it from the oven. Drain the filling goods of any liquid or juices, and transfer to the center of the dough, distributing it evenly from top to bottom. Top 3/4 of the dough with sauce, followed by cheese. Use your hands or the parchment paper to assist you in rolling the bare side of the dough over the middle fillings, followed by the sauce and cheese side over that. 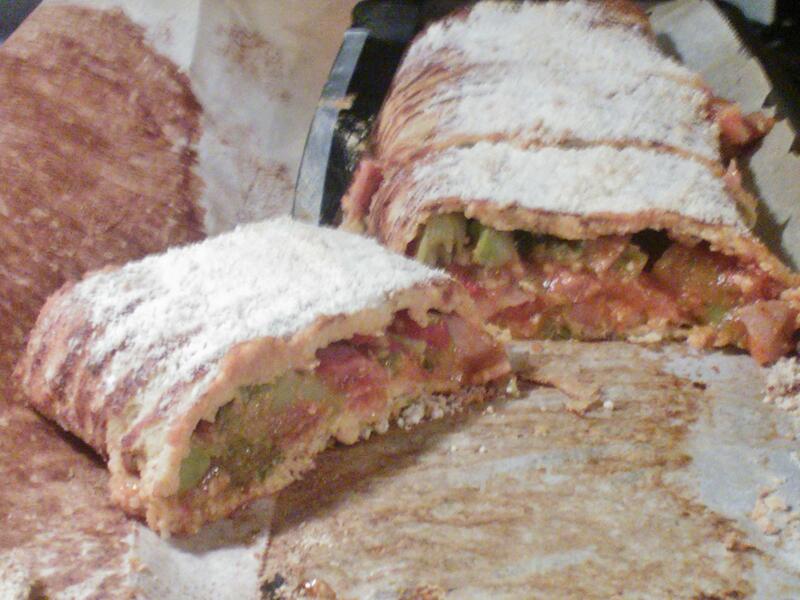 Again, by hand, or using the parchment paper, roll the stromboli over so the seam is facing down. 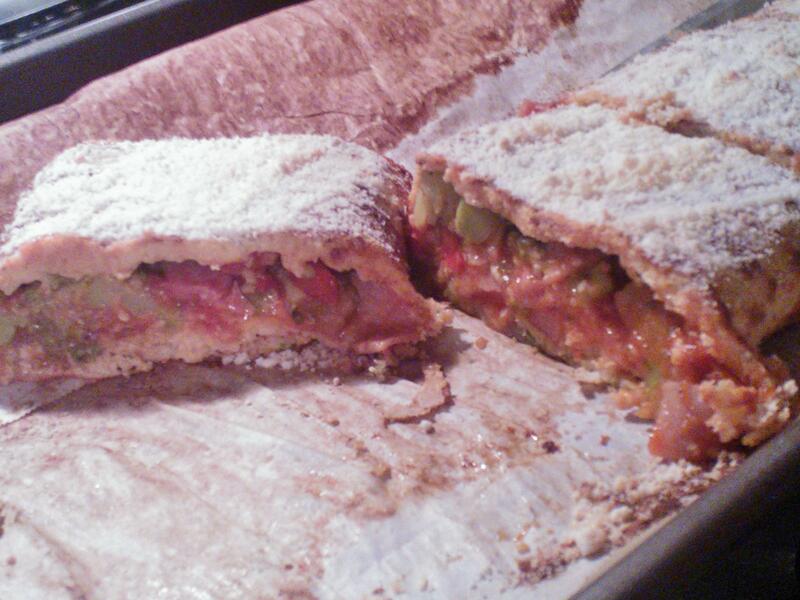 Sprinkle the topping mix over the boli and return to the oven for a final 12 min. Remove from the oven and allow it to settle for a brief 3 minutes. Cut into 6 pieces, beginning with the knife’s tip in the middle, and cutting to the edge, worked best for me. Serve it with a side of dipping sauce/marinara and Buon Appitito! Both were winners, but I hate to say that the second one tasted legit! As I’ve mentioned before, my favorite calzone is ham, spinach, and ricotta. 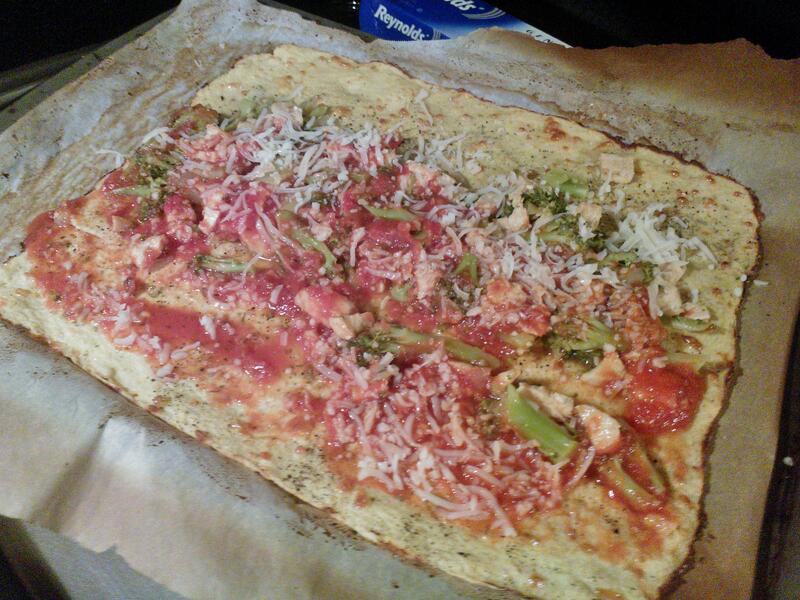 I’ve made a pizza out of that craving, but I can not wait to make this craving into a stromboli! Gah! My mouth is watering just thinking about it. Oh man! And brush it with garlic butter on top!! Apples and cheese are a classic fondue pairing. 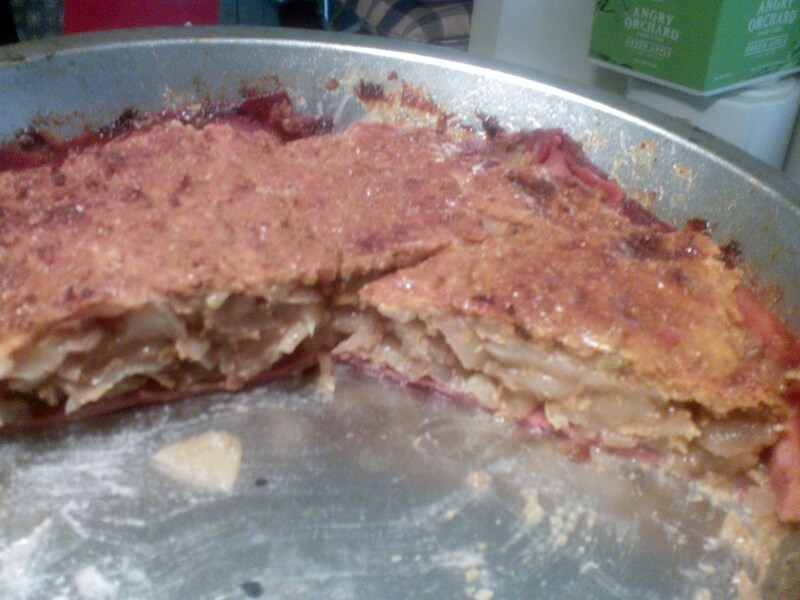 So on Pintrest, it really doesn’t surprise me that there are so many apple-cheddar pies. Some put the cheese in the crust, others in the pie, and others on top. And it didn’t just stop at cheddar and pie. There was Brie, and gallettes, and hand pies, soups, and dips. You all know my experimentality and how much I adore playing in the kitchen. Needless to say, Pintrest got my gears turning… Some food combos just taste odd together, like this grapefruit protein shake I made one time (not a good post, Pintrest)… But lets face it… bacon goes with EVERYTHING! 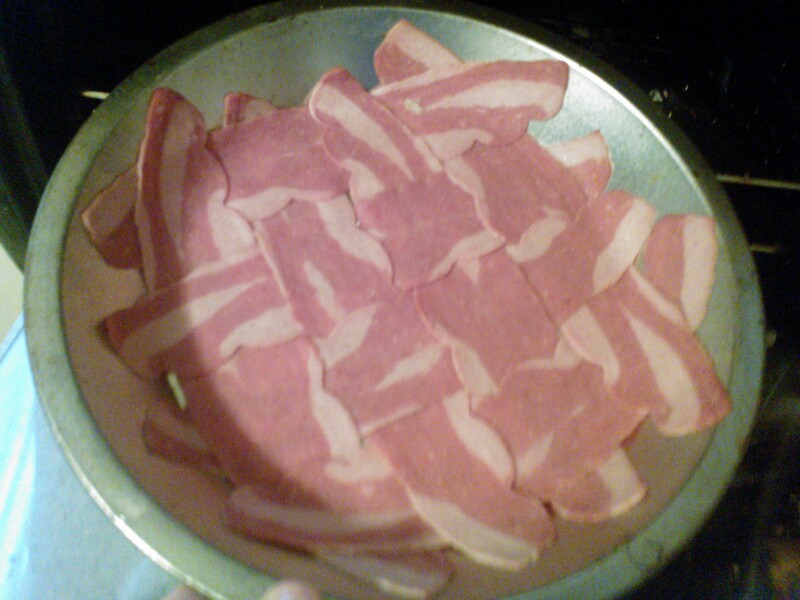 Preheat the oven to 350 F. Spray a 9-in pie pan with nonstick cooking spray and weave 8 slices of turkey bacon. 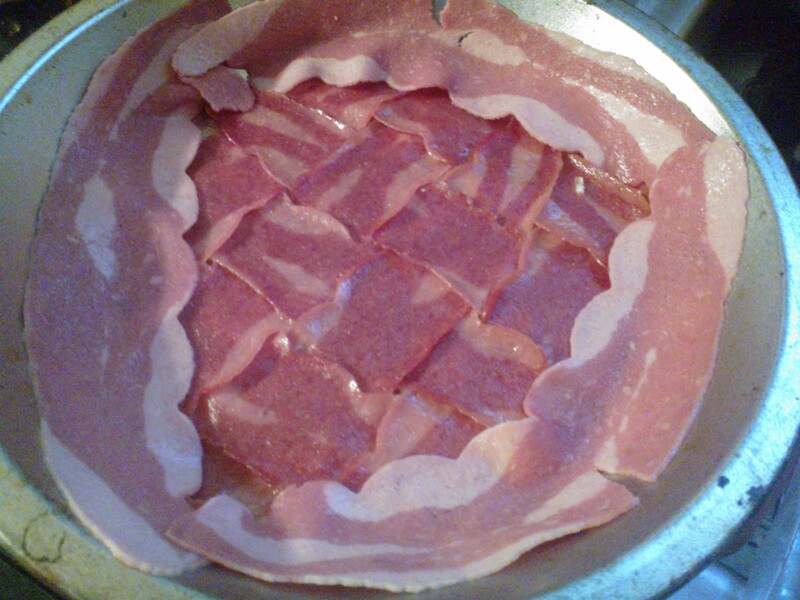 Line the last three slices of bacon around the walls of the pie pan to create the crust. I found that making a little tear in the middle of those three slices helps keep the bacon from rolling down the sides of the pan. Bake for 20 min. 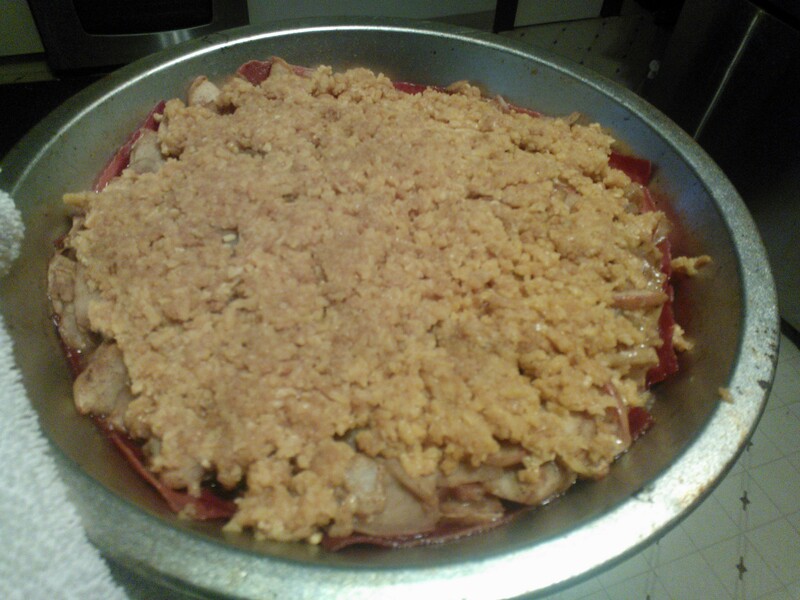 In the meantime, core and thinly slice the apples. Then, cut your slices in half and measure 4 cups. 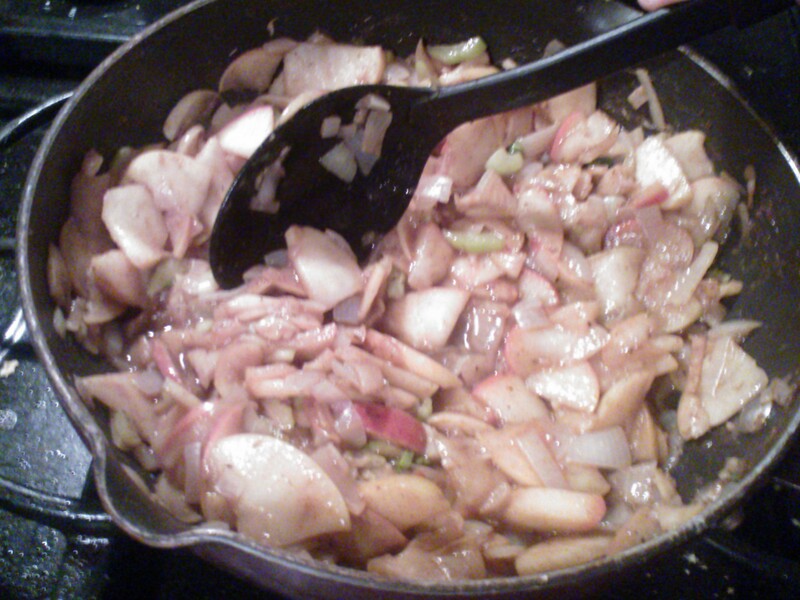 Combine the apples, celery, and onion in a large skillet on medium heat with 1/2 cup of water. Cover with a lid for 10 minutes. Remove the lid and sprinkle with thyme, sage, garlic, Splendas, cinnamon, salt, pepper, vanilla, and lemon juice. Toss the mixture. Whisk the cornstarch with cold water until dissolved and pour over apple mix. Recover with the lid until bacon crust finishes baking. Meanwhile, in a food processor, chop 3/4 cup shredded cheddar. Set aside. Next, process the cereal until extremely fine. Add the remaining 3/4 cup cheddar to the processor, and blend until evenly distributed. Stir just the processed cheese into the apple mix, and transfer mix to the baked bacon, spreading the cheesy blend evenly over crust. Return to the 350 F oven for 15 minutes. Lastly, add the unsweetened applesauce to the processor of cheese and Fiber One crumbs and blend until a crumble is created. Get messy, and use your hands to crumble on top of the warm pie. Sprinkle with a little salt and pepper and return to the oven for a final 25 minutes. Let it cool for about 10 minutes, while you make the optional sauce. What really is the icing on the pie is this sweetened thyme yogurt sauce! 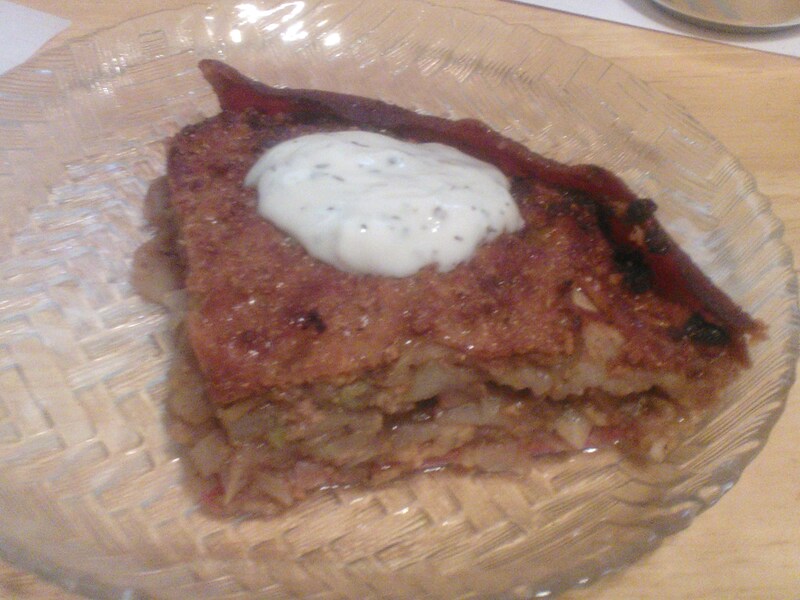 Rather than sticking with the sweet/tart, salty feel, I wanted something a little more savory. 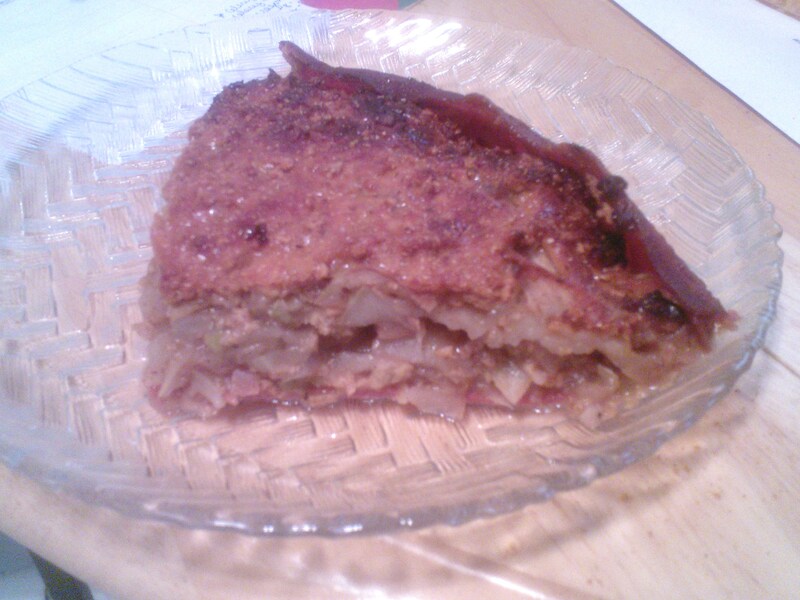 I was really impressed that the bacon crust stayed perfectly together when the pie was sliced. I was even more impressed by the the afterthought of dressing up some yogurt. Thank goodness for that afterthought, too, because it tied all the sweet and savory flavors if the pie together. I would imagine that this could also be served with an over-easy egg, where the yolk would act as the yogurt sauce. 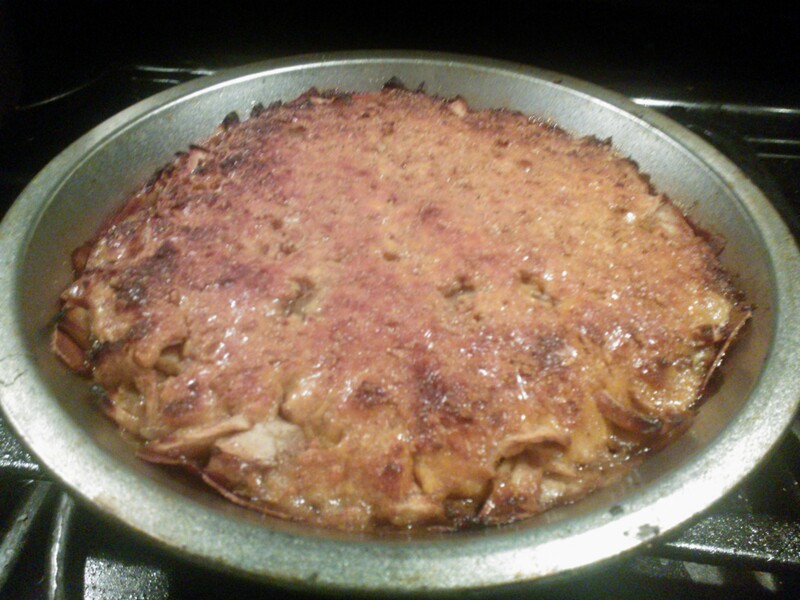 I’ve sort of rediscovered my love for apples recently so you may see another apple pie riff sooner that you think. I know its not winter, but by the way Mother Nature has been treating us, I don’t think she got the memo… So on such a cold, rain day as today, I believe a warm, cozy, creamy meal is well called-for. 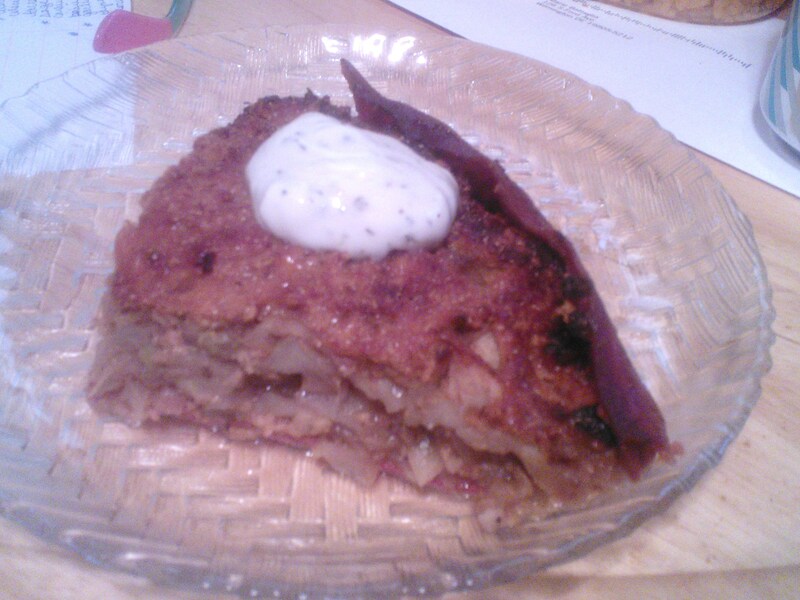 After seeing this recipe on Pintrest, I thought… I like veggies.. I like cheese… Makeover!!! Preheat the oven to 350 F. In one bowl, combine the vegetables. In another bowl combine the cheeses, and in a third bowl combine the remaining ingredients (I also added a finely chopped jalepeno for heat). 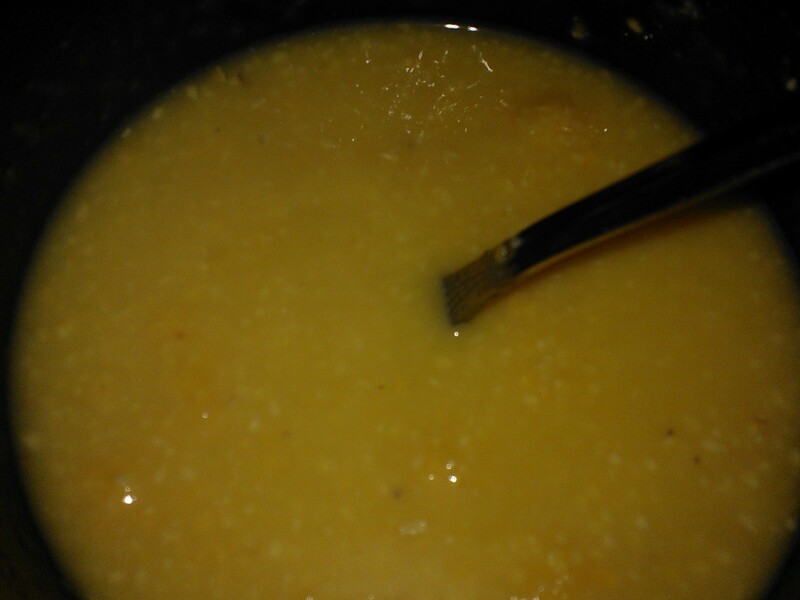 Add half the cheese mix to the bowl of food glue (the soup-yogurt-egg- spice combo). Once well-combined, evenly coat the mixed vegetables. Spray a 9 x 13 dish with non-stick cooking spray. Transfer the coated vegetables to the dish, and evenly spread into the corners. Top the casserole with the remaining cheese blend. Bake for 1 hour, uncovered. 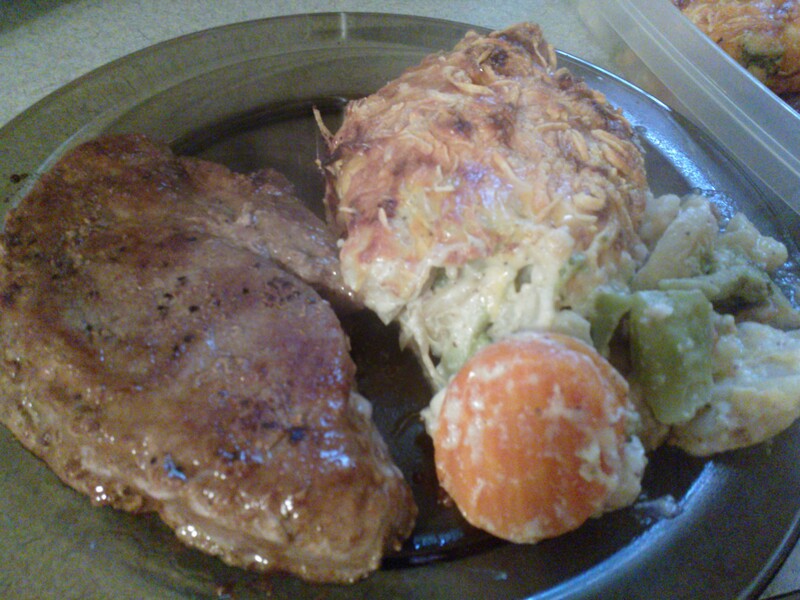 I served this with steak, and a doggie bag for pops to take with him. 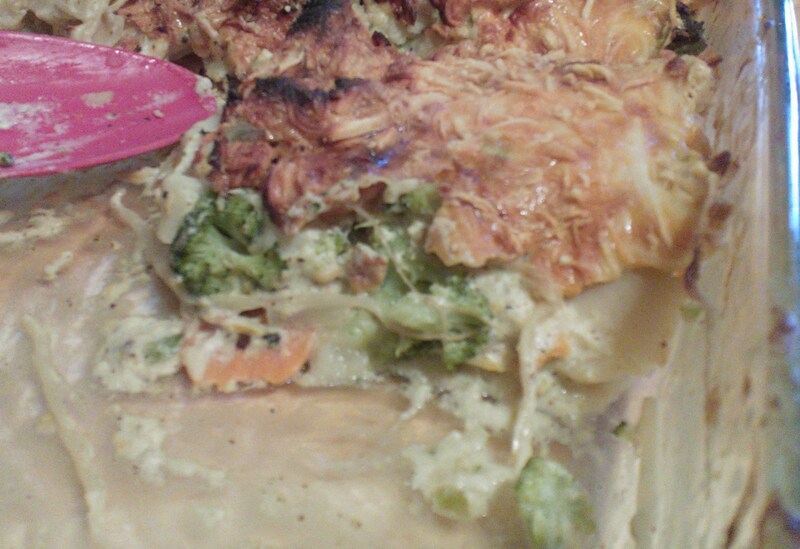 You could probably add the protein to the actual casserole, as well, and then bake it…. Or for a meatless meal, like I did, eat 1 1/2 servings for about 300 calories! Whats not to like? The crispy cheese shell? The creamy blend hiding just beneath it? Exactly! Dig in! I started thinking about how versatile this recipe is. With the water chestnuts and bean sprouts, I began to think about playing on the Asian influences and tweaking this with Asian sauces and seasonings. I think my favorite part of the this were the carrots. I just love how cooking carrots brings out their naturals sugars and sweetness!! Today began with a plan: Refrain Run to the store, grab cat food, swing by the garage and grab my bike, put air in the tire, ride it home and enjoy a shake. Things went just as planned, except for the fact that I left the key to the garage at home. Yay, for Frank being awake because he ran it over to me. It inspired him and he proposed that he grab his bike and we ride together! After walking our deflated bikes to the gas station, we rode them home. I forgot the muscle groups biking works. My quads hated me! It was so great to see Frank on a bike! He was smiling, and really enjoying himself! This brief little bike ride set us up for a great day of decisions! 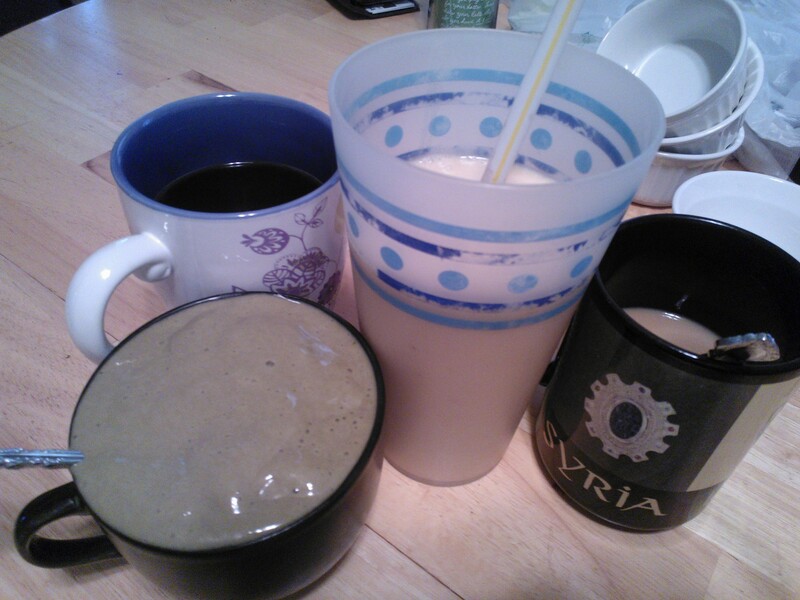 While I prepared our shakes, Frank brewed some coffee. I made Frank a Banana Blondie shake, which is just the Blondie recipe with a banana, and a Butterfinger shake bowl for me, which is a Blondie shake with chocolate protein mix, rather than vanilla. I threw a handful of spinach in mine for a little added vitamins. I don’t know about you, but I LOVE a good cheesesteak! What I don’t love is the typical carbs, fat, and excessive calories that go with it. With my new Chicken Steak-Umms screaming my name from the freezer, this was created! Preheat the oven at 400 F. Steam the chopped cauliflower. Drain and transfer to the food processor and briefly pulse the cauliflower until it is riced. Combine the warm riced cauliflower with the shredded mozzarella, liquid egg, and spices. Spray a pan well with non stick cooking spray. Add the sliced peppers, cover with a lid, and allow to cook for 9 minutes on the lowest heat. Add the sliced onions, minced garlic, chopped mushrooms, and black pepper, recover, and maintaining the lowest heat setting, allow the vegetables to cook down for 15 to 20 minutes, stirring occasionally. 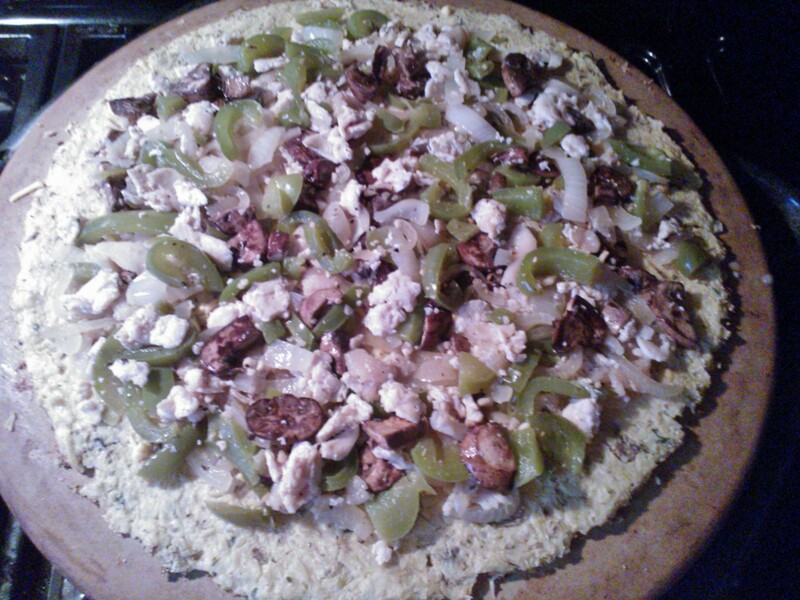 Sprinkle a heated pizza stone or pizza pan with the cornmeal and spread the cauliflower dough evenly over top to form the crust. Bake for 20 minutes. While the crust is baking, remove the steamed vegetables and give them a rough chop. 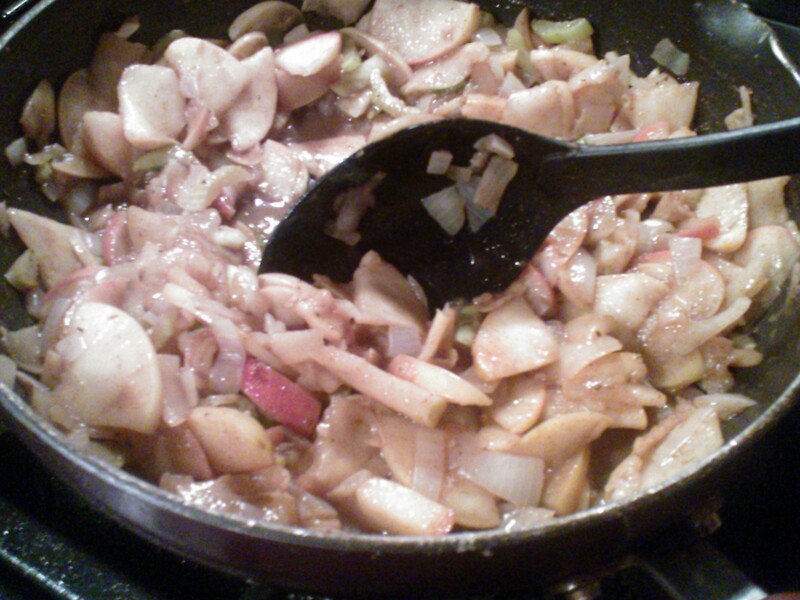 In the pan used to make the vegetables, tear the chicken Steak-Umm slices, season with pepper, and cook. Get your hands messy and toss the chopped vegetables and chicken together. By this time the crust should be done. Remove the crust from the oven. Using a spatula, ensure the crust is not sticking. 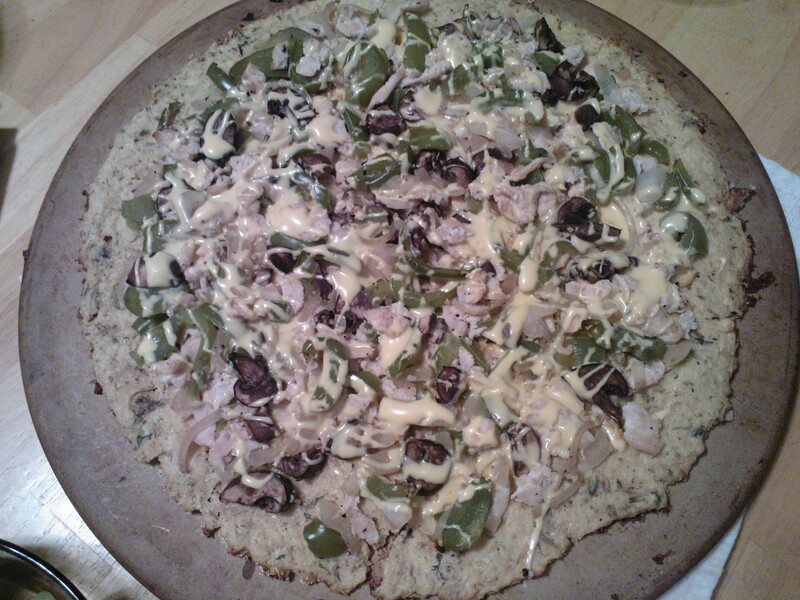 Sprinkle the shredded cheddar on the hot crust. 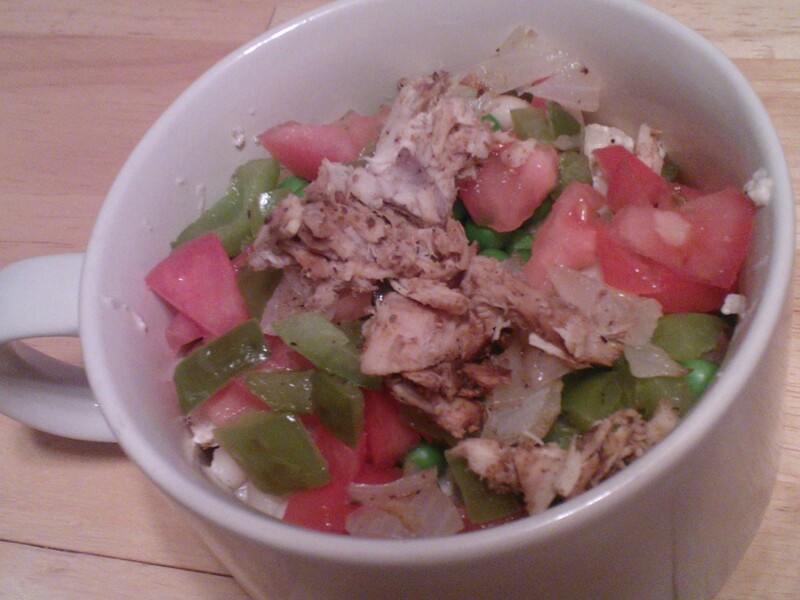 Then, top with the vegetables and chicken steak mix. Return to the oven for an additional 10 to 12 minutes. Remove from the oven. In a microwaveable cup, break the slices of cheese and sour cream. Microwave for 30 seconds, stirring every 7 seconds or so. Drizzle the wiz over the pizza, slice, and serve! 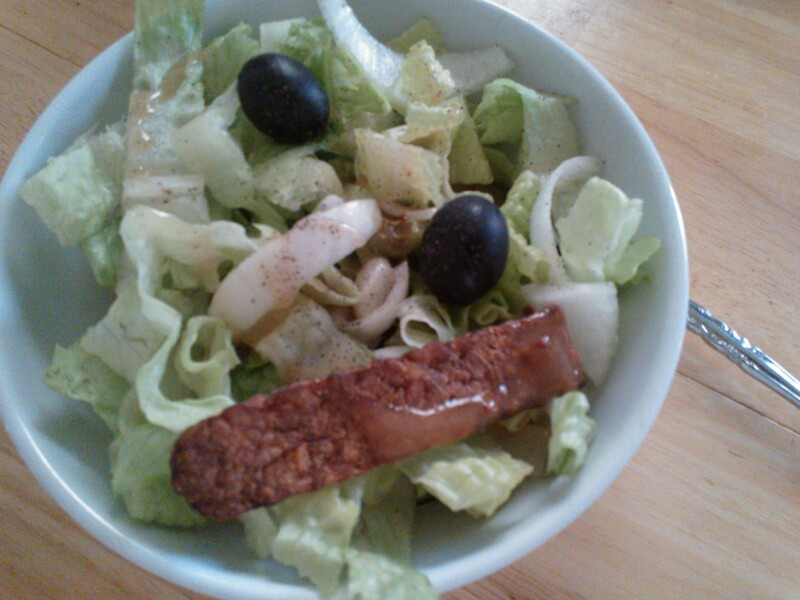 We ate dinner with big refreshing salads. 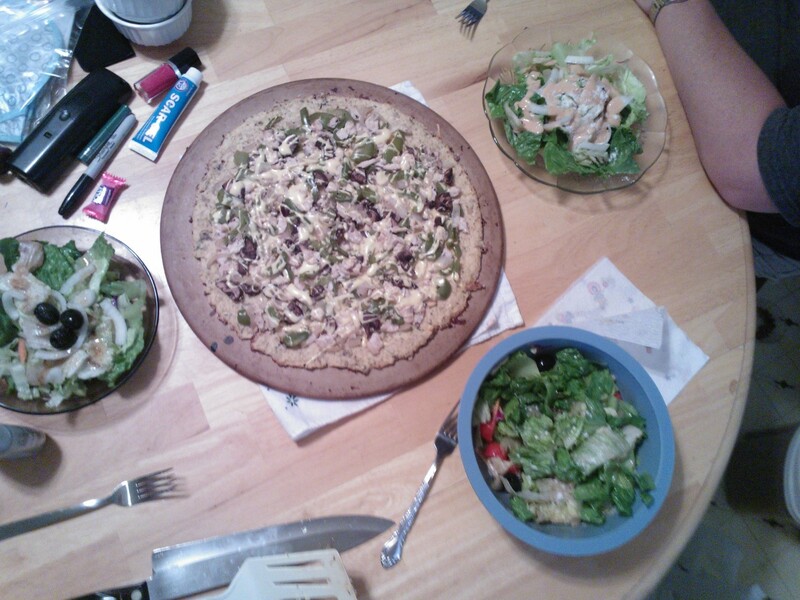 Dad topped his slices with crushed red pepper flakes. Dinner with my daddies! Haha! I told my dad that dinner would be ready as soon as I “drizzle my wiz.” He said, “Okay, Snoop. Drizzle your wizzle, dog.” Hahah! To end the night, Frank and I sat on the porch and enjoyed a sugar free Cherry Popsicle for National Cherry Popsicle Day! Its early to bed, for me tonight. I am quite sleepy. See you in the AM. Every kid loves mac n cheese. Even as an adult, its hard to resist the carby, gooey, cheesy goodness. Of course, as an adult, I’ve now expanded my mac n cheese horizons with stewed tomatoes, tuna fish, various vegetables, different cheeses, or splurges like Valanni’s crab and lobster macaroni and cheese. 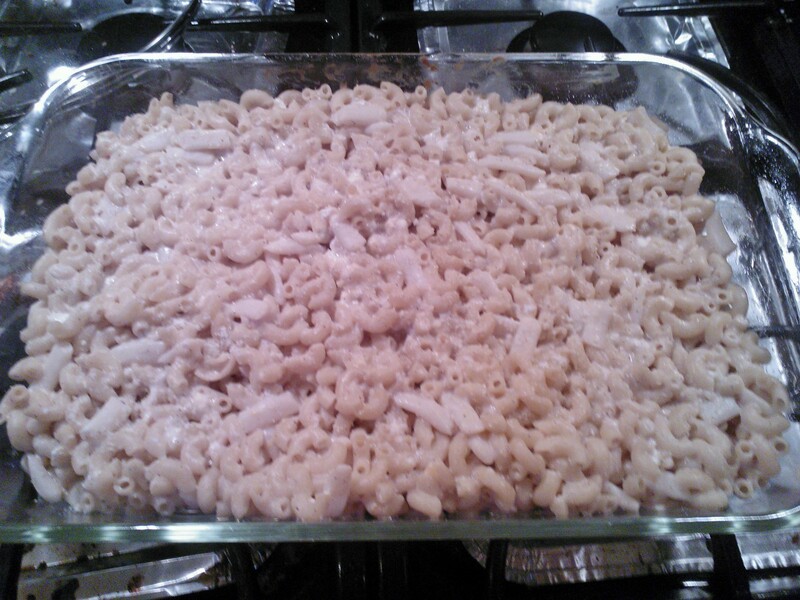 Its pretty difficult to find a mac n cheese that gives you all the bang for your calorie buck. When I’m really jonesing for it, I go with Fiber Gourmet’s Light Mac-mmm-Cheese. Have you ever had the shells? The white cheddar? The shapes and cartoon characters? Blue cheese? Whats your favorite mac n’ cheese? Are you a Velveeta person or Kraft? Have you tried any flavors by Betty Crocker, like pizza or grilled cheese? Have you ever had mac and cheese pizza? What about mac n cheese burger? How do you make your mac? 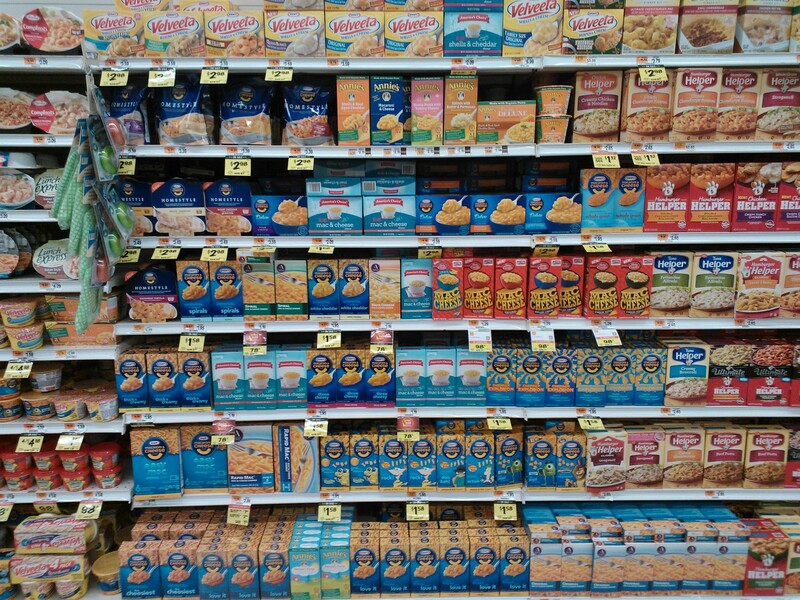 Macaroni and cheese is such a staple food in America, we are literally surrounded by it! The guys at Barry’s house go through it like its water and they frequently visit a local restaurant that only makes mac n cheese! I’ve been on a mission to create a mac and cheese recipe, but upon googling, I found so many different ways to make it! 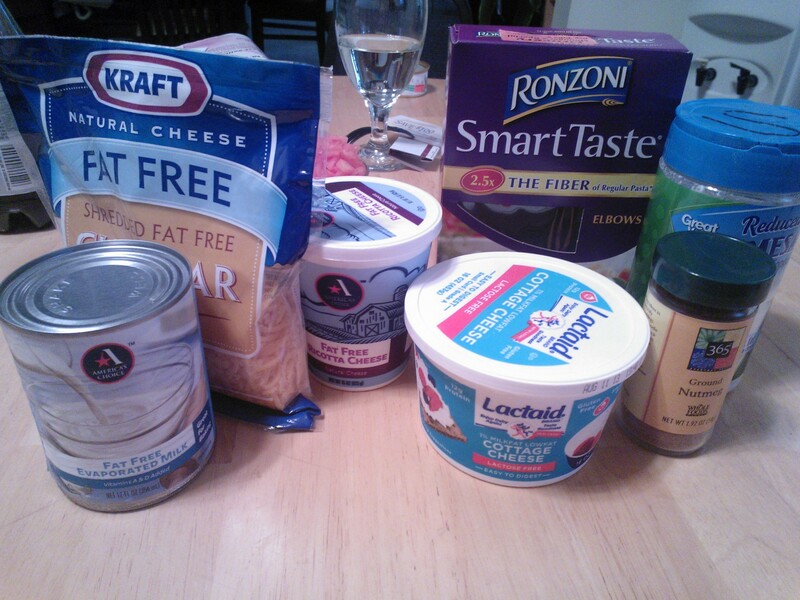 Cottage cheese, evaporated milk, cream, half and half, mustard, bread crumbs, bake, stove top, types of cheese, sour cream, cream cheese…. I mean, how does one choose? I still remember how cool I thought EZ-Mac was when it first came out when I as a kid! So, this comfort food-filled week was packed with meatloaf, garlic mashed potatoes, guiltless ice cream, and now, to wrap it up… can you guess? 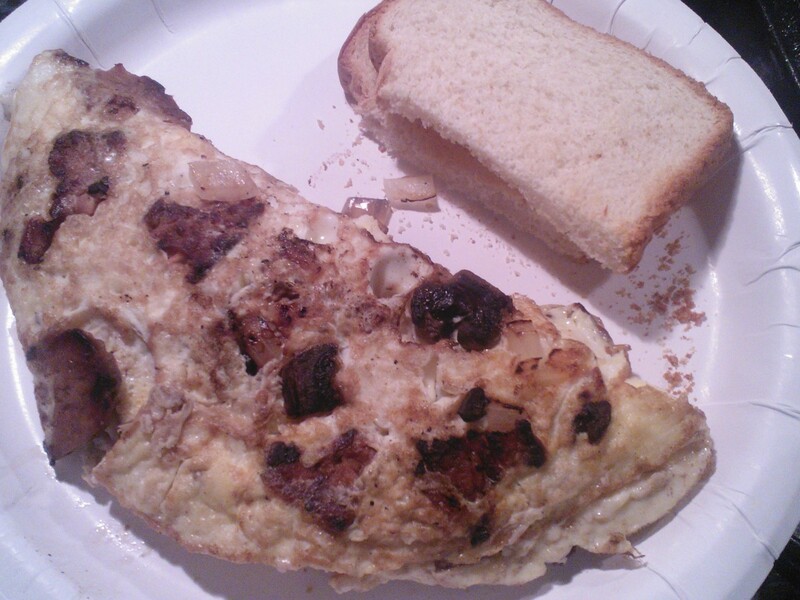 I chopped up tomato, mushrooms, and onion, as well as the Fakin Bacon tempeh and whipped up and an omelette with swiss for Frank, and mozzarella for me. It was great with some hot sauce on top! 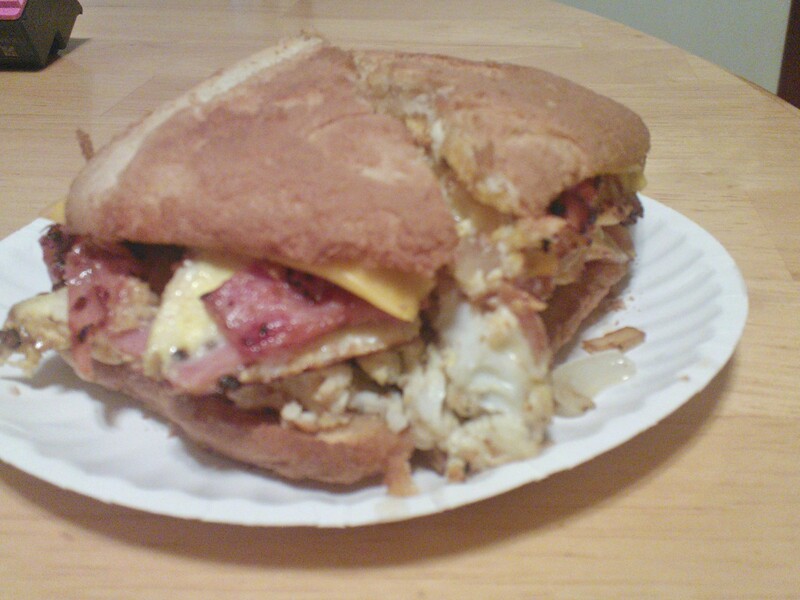 I decided to be a nice big sister, and Dom, my youngest brother, seemed super excited about the idea of a big breakfast sandwich! I threw some ham lunch meat and veggies in the skillet and served it up with cheddar on toast! Since it was pouring, I sat at the kitchen table and studied away. 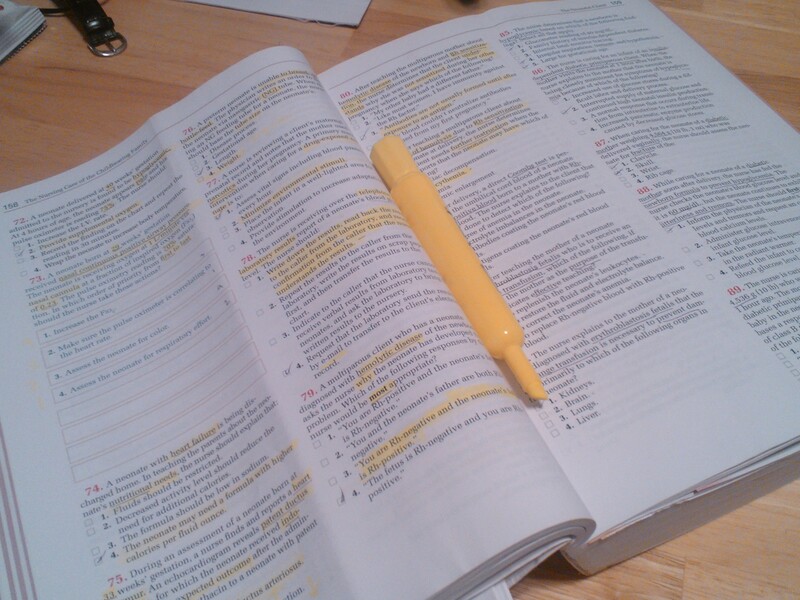 I guess I’ve been studying hard because I killed a highlighter. (Yay, for dad who sells them… I’ll never need office supplies). After a bunch of studying, my brain needed a break! After about an hour of serious procrastination on the computer, I needed to get out of this house! Thank God it stopped raining and I went for a quick 1 mile jog to clear my head and then resumed studying. Preheat the oven to 350 degrees. Heat the evaporated milk in a saucepan over low heat. Add the cheeses until they melt, stirring constantly. Stir in the nutmeg, pepper, and salt. Remove the cheese sauce from the heat. Add the cooked pasta to the cheese sauce and mix well. 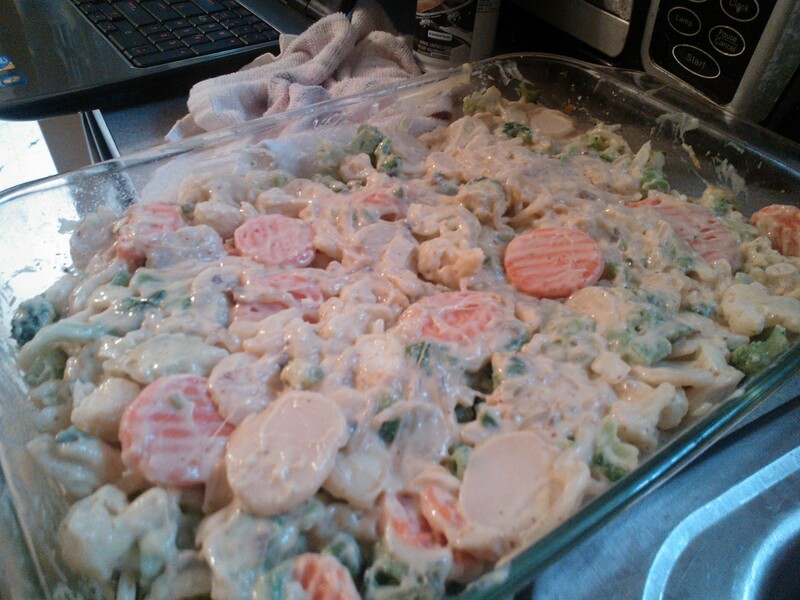 Pour the mixture into a 2-quart casserole dish that has been sprayed with non stick cooking spray. Sprinkle with Parmesan cheese. 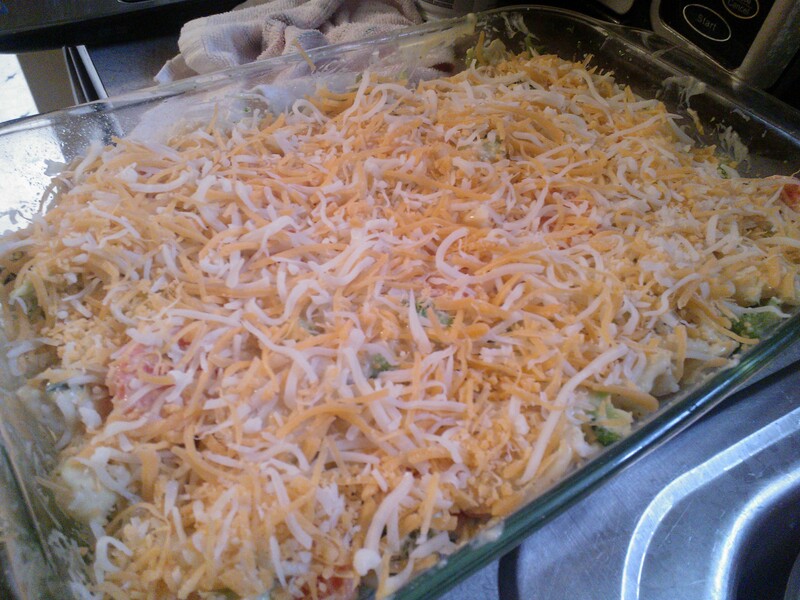 Bake the casserole for 15 minutes until the top is browned. Top with what ever you’d like~ tomatoes, tuna, peas, more cheese, mustard (Barry puts ketchup on his, I don’t get it, but then again, I have some odd taste buds, too)! *Since the recipe called for 1 lb of pasta, and the box only comes in 12oz, I improvised with the low cal, low carb option. Wow! I was so paranoid about the outcome of this dish! There are just so many different seasoning and ingredients, I did not know what I should season this with! 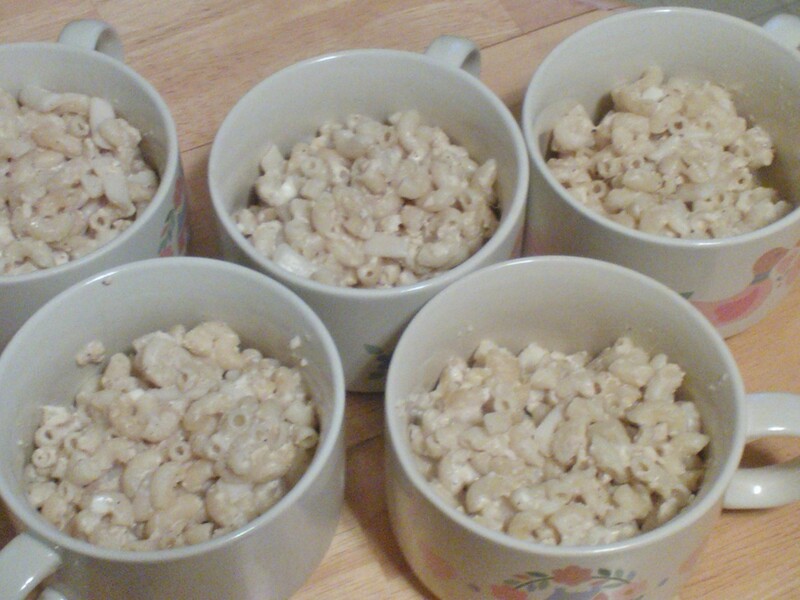 The above recipe is a perfect mac and cheese for the simple soul and the best to dress up! 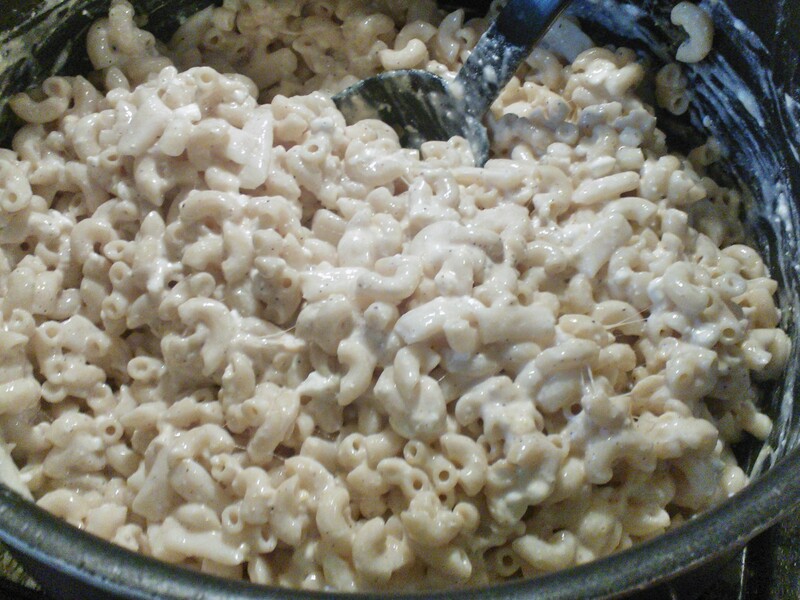 Its not an abundantly creamy like a Kraft mac, but I loved the homemade taste and consistency! 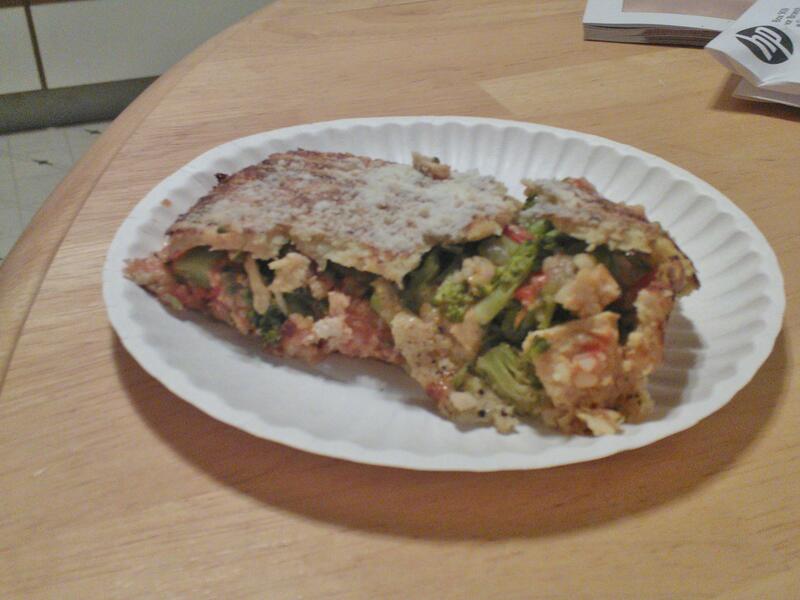 I topped mine with a bit of everything, except the crumbles ( I saved that for the men). The veggies the bowl so colorful and added so much flavor! To make this recipe even more meaningful to me, my mom informed me that Macaroni and Cheese was one of my grandpop’s favorite dishes! Today marks 8 years ago that he passed away. This is for you, poppop! I hope you would have liked this dish as much as we did! We miss you and we love you! I did not have much of an appetite this morning when I woke up, so I headed to work with some snacks, just in case. 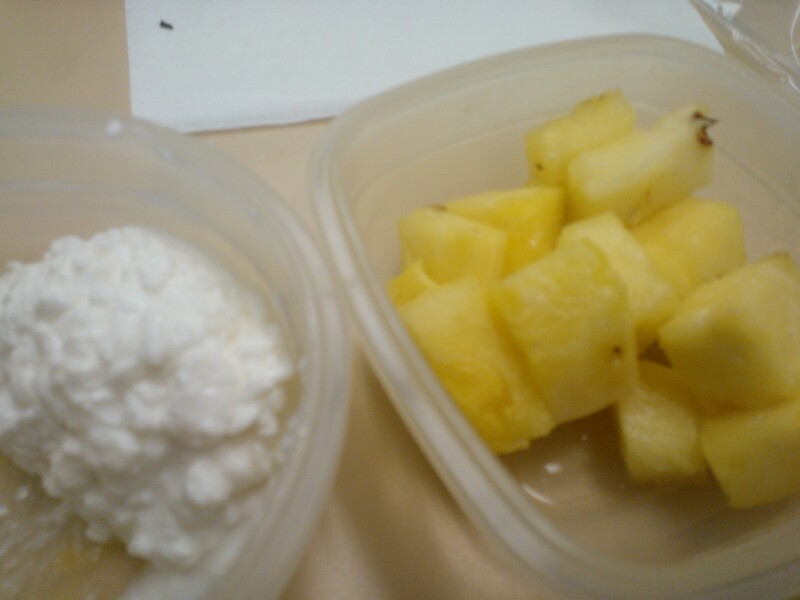 Lunch was healthy… pineapple and cottage cheese. 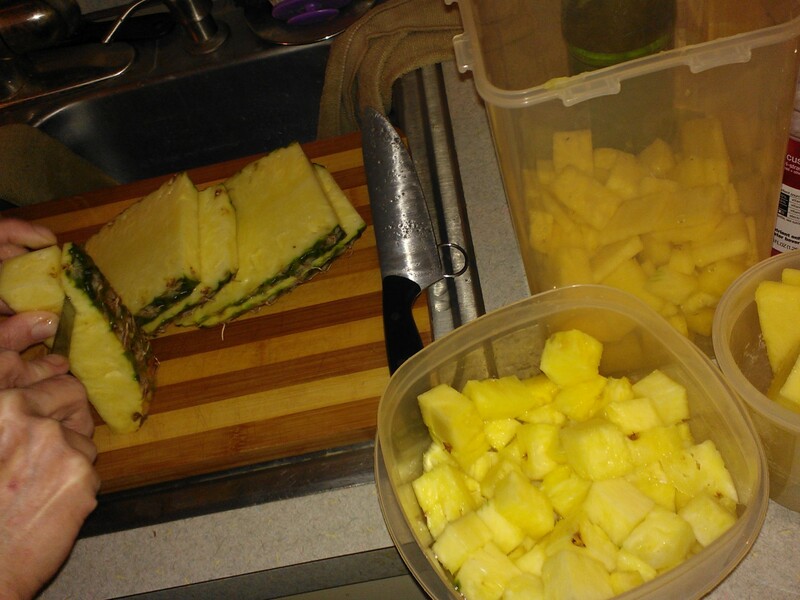 The other day mom bought a pineapple and it was so sweet and delicious, she ran back to the store and bought 2 more! I’ve been in my pineapple glory! When I got to the unit, Julie was there with my girl scout cookies. I totally forgot I ordered these. Down the hatch went some do-si-dos. Those are some dangerous cookies! Later, I made a bowl of oatmeal, that I actually meant to eat earlier in the day. I find that with a lot of instant oatmeal, with berry flavors, they are just too sweet! I mellow it out with some ground flax. 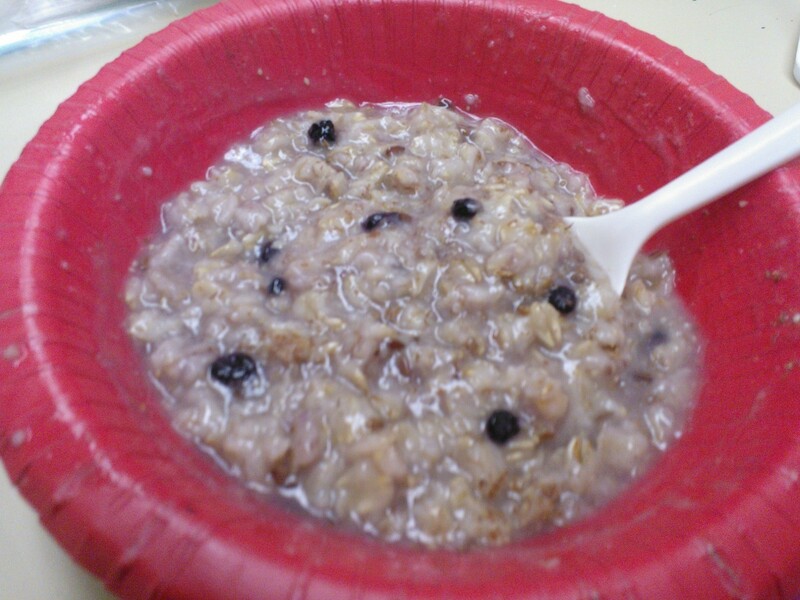 I’ve never tried this oatmeal before, so I did not know its sweetness. I have to say though, the flax made it all the better! I never actually wound up eating dinner tonight. Not because I was too busy to eat, but because a certain chica (myself) ate a few too many cookies… and got a belly ache. Silly Sammy… oh well, at least my dinner for tomorrow night is already at work. I went home, craving real food! I wound up eating a bowl of cereal and some pineapple. I lectored at Church this morning and it was really nice to see some friends I hadn’t seen in a while. Deacon pulled me aside to tell me how worried he was about me and how happy he was to see me put on weight. I like to hear things like that but I’m definiately ready to get rid of this belly I put on. This morning, I ate a packet of Quaker Cheddar Grits. When I first opened the packet, the chedder smell reminded me of the Easy-Mac cheese. Even though its been sunny, the wind chill was just too cold for me, so Day 5 of Couch to 5K was out today. Instead I did a 12minute warm-up with Dave Sinclair OnDemand and followed it up with Julie’s Jump Rope n’ Abs Workout. I’ve really been on a serious cerel kick, lately. 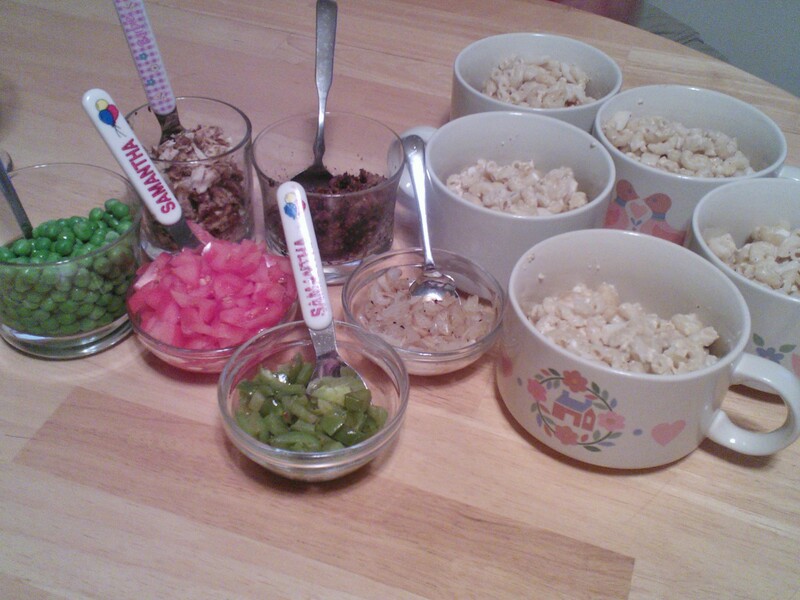 Every time I go for a snack, cereal is the winner. For lunch, before I headed to work, I finished off my Cinnamon Pecan Special K cereal. If you recall, I said earlier that I did not care for the cereal with milk, but by itself, its a keeper. Well, the same goes for Kashi’s Berry Blossom cereal. I had a bit of each left and decided on a combo deal. YUM! I don’t know if the Special K tasted better because all the nuts and cinnamon settled to the bottom of the back, or what, but it was tastey! Dinner was what I did not eat last night: Lean Cuisine Chicken with Basil Cream Sauce. Ialso steamed some frozen oriental vegetables to soak up some of that excess sauce. I added some black pepper, like I do with most things. Myfavorite part of this frozen meal was the Italian green beans! 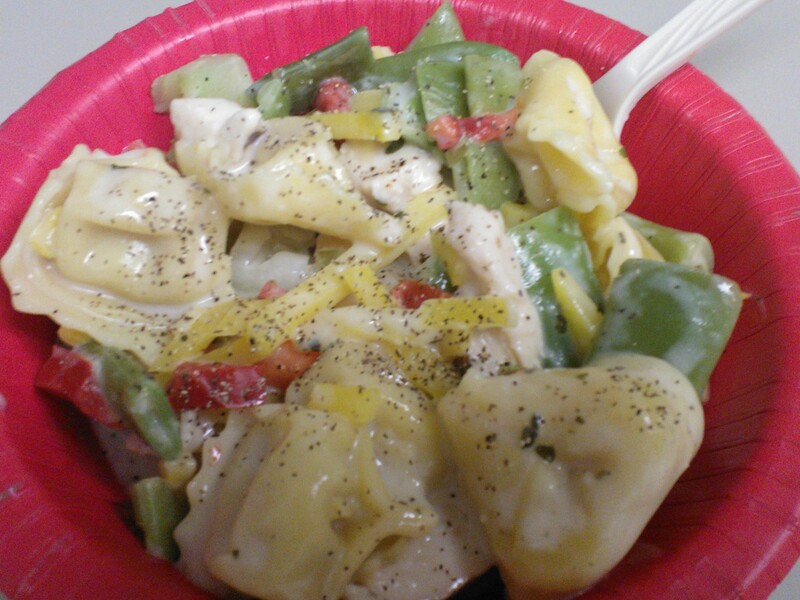 This isn’t a favorite meal, but the added veggies helped and I could eat those green beans all day! Dessert came with a little sugar and some staying power. 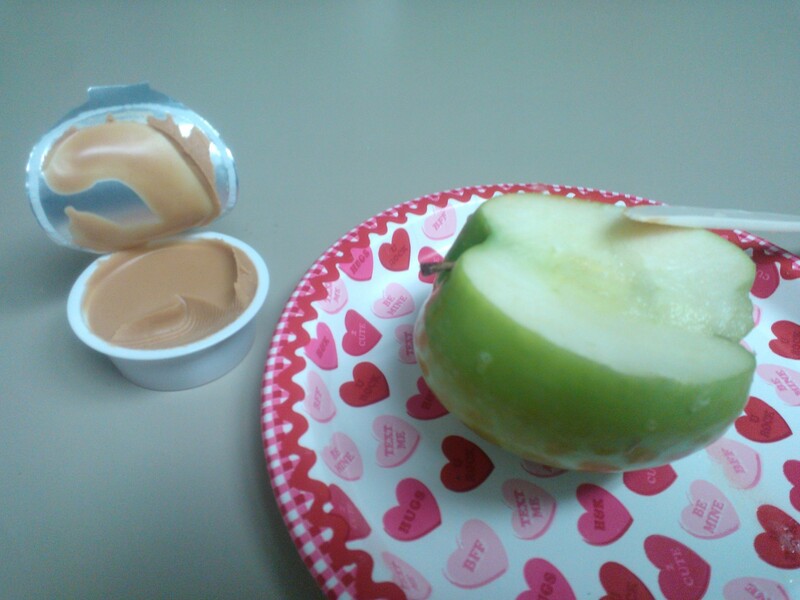 A granny smith with some hospital PB made its way into my tummy. I start my new rotation tomorrow morning at a new clinical site. I’m kind of exciting since the place does similar work to my actual job, but the paperwork looks a little intimidating.